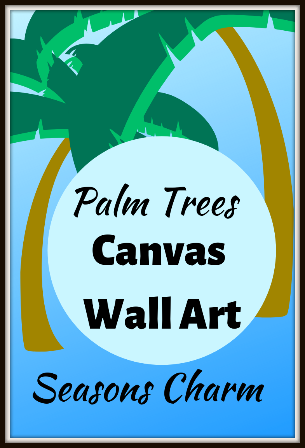 The palm tree canvas wall art makes a beautiful housewarming gift. The beach scene palm tree canvas art is great for those who love the beach or who have gone for holidays at the beach. Can you imagine relaxing on the beach with palm trees swaying in the gentle breeze right inside the sitting room? Hanging up a framed palm tree beach canvas wall art picture will do the trick. Bring the smell of the sea and the feel of the gentle breeze into your sitting room with the cheerful multi color palm tree canvas art. Hang up the palm tree canvas art above your bed or in the sitting room and have a relaxing day at the ‘beach’ at home. The picture offers a relaxing scene after a stressful day at work. 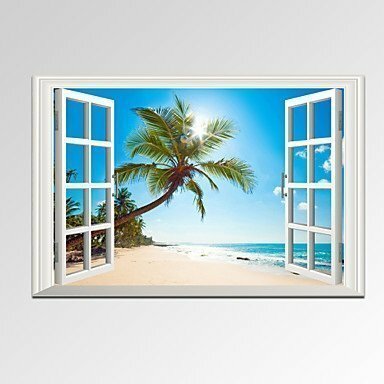 The palm tree wall decor with beach scene truly reminds you of your relaxing and happy beach holiday. Using high quality pine and stretched canvas frame, the relaxing palm trees wall canvas photograph print beach scene artwork is great as a housewarming gift. The window is part of the included landscape and adds to the realistic feeling of looking out onto the calm and serene beach scene. This piece of beach scene stretched canvas wall artwork measures 24″ x 36″ and comes ready to hang. The beautiful palm trees beach scenery image is printed on high quality canvas.